Craft Paints - in colours of your choice. I used Dala Lemon, Coral, Bright Pink and Lavender Rose. EVA Sheets or sticks in pink, orange and white (for the feet and facial features). 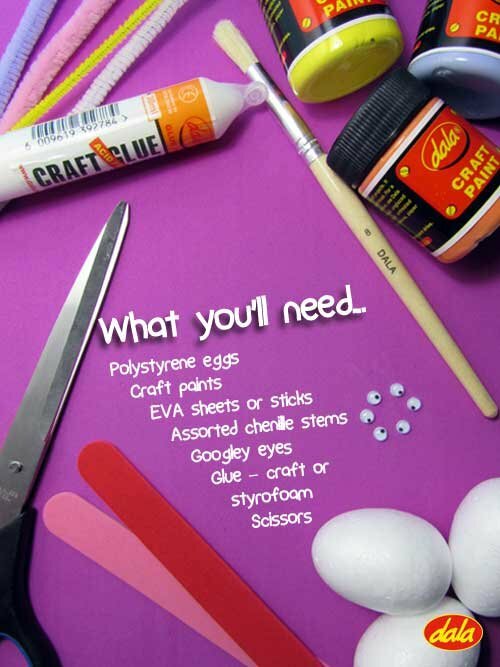 Assorted chenille stems - matching your chosen paint colours, and an extra white one. Googley Eyes - choose something proportionate to your eggs. I used 5mm. Choose some craft paint colours to paint your eggs. Based on those colours, choose matching chenille stems. Now you can refine the shapes of the feet by cutting out the toes, as well as the noses and beaks if you wish, or just leave them as is. 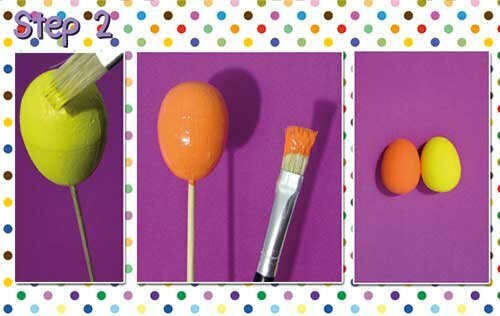 If you do have a skewer stick handy, pierce the egg and allow the egg to sit on the stick as you paint. If you don''''t have skewer sticks you can use forks instead, making sure the holes made are on the bottom half of the egg. Alternatively you can hold them while you paint and get your fingers a little messy. Give each egg 2 coats of craft paint, making sure to fill in any pock marks or holes with the paint. Allow to dry by standing the skewer upright in a jar or glass. Allow these to dry for about 10 -15 minutes between coats. 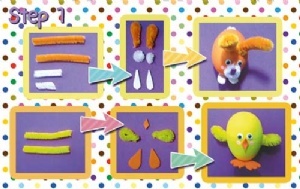 Now that your eggs are dry, you can begin to glue the features onto them. You can make some bunnies on their hind legs or bunnies on all fours by turning the egg horizontally/vertically. 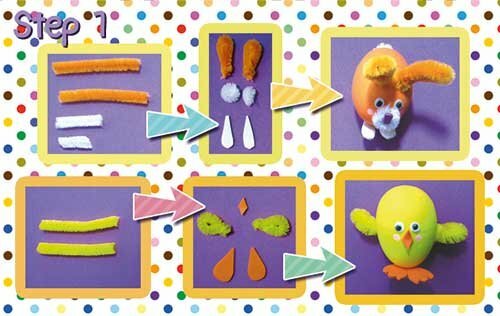 Begin by gluing on the googley eyes where you choose. This will give you an indication of where the other features should sit on the face. Next glue on the mouth shape, and on top of that stick the EVA shape you cut for the nose. 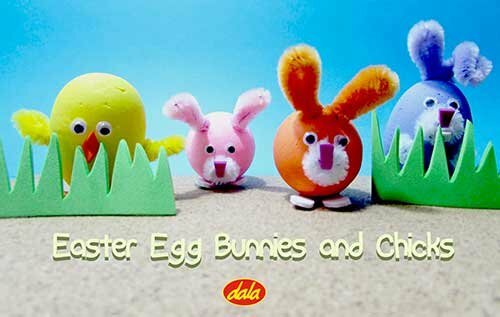 Then, glue on the little chenille stem tail you made. Next, glue on the feet. Once again, depending if your bunny is upright or not, this will determine the placement of the feet. Lastly, place two blobs of glue on the top of the bunnies head for the ears. To stick the ears on, push the chenille stem ear shape into the polystyrene and glue blobs so that the polystyrene has been pierced. This will strengthen them. Leave this to dry for about 20 minutes. Next glue on the EVA mouth shape, only placing glue on the fold you made earlier. Next, glue on the feet, and positioning them so that the chick can stand independently. Allow to dry for a few minutes. 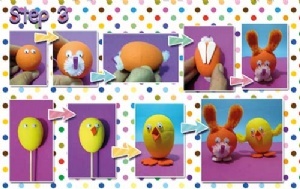 Lastly, place a blob of glue on each of the chicks sides for the wings. To stick the wings on, push the chenille stem wing shape into the polystyrene and glue blobs so that the polystyrene has been pierced. This will strengthen them. While you are waiting for your creatures glue to dry, you could add some extre facial features. I chose to paint rosy cheeks on all of my characters. This item has 839 views.